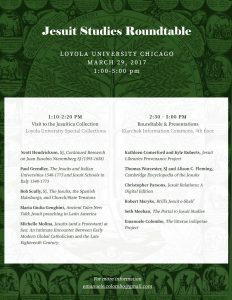 Loyola University Chicago hosted a Jesuit Studies Roundtable in advance of the annual Renaissance Society of America conference. Organized by Emanuele Colombo (Depaul University) and Stephen Schloesser (Loyola), the workshop consisted of presentations of current and future scholarly and digital projects. Emanuele Colombo, on the litterae indipetae Project.